The One Hundred Fifteenth United States Congress was a meeting of the legislative branch of the United States federal government, composed of the Senate and the House of Representatives. It met in Washington, D.C. from January 3, 2017, to January 3, 2019, during the final weeks of Barack Obama's presidency and the first two years of Donald Trump's presidency. Several political scientists described the legislative accomplishments of this Congress as modest, considering that both Congress and the Presidency were under unified Republican Party control. According to a contemporary study, "House and Senate GOP majorities struggled to legislate: GOP fissures and an undisciplined, unpopular president frequently undermined the Republican agenda. Most notably, clashes within and between the two parties strained old ways of doing business." Senator Dianne Feinstein interviewing Supreme Court nominee Brett Kavanaugh. January 5, 2017: House of Representatives condemned United Nations Security Council Resolution 2334. 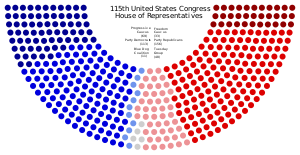 January 6, 2017: Joint session counted and certified the electoral votes of the 2016 presidential election. January 11–12, 2017: Senate, in an all-night session, took first steps to repeal the Affordable Care Act, (ACA). The final vote was 51 to 48 to approve a budget resolution to allow "broad swaths of the Affordable Care Act to be repealed through a process known as budget reconciliation." January 20, 2017: Inauguration of President Donald Trump. February 7, 2017: Vice President Mike Pence cast the tie-breaking vote to confirm Betsy DeVos as Secretary of Education. This was the first time in United States history that a cabinet confirmation was tied in the Senate and required a tie-breaking vote. February 28, 2017: President's speech to a Joint Session. April 6, 2017: Senate invoked the "nuclear option" to weaken Supreme Court filibusters. Nominee Neil Gorsuch was then confirmed the next day. June 14, 2017: Majority Whip Steve Scalise and several staffers were shot during the 2017 Congressional baseball shooting. They were practicing for the annual Congressional Baseball Game. September 1, 2017: The Parliamentarian of the United States Senate decreed that the Senate had until the end of the month to pass ACA repeal via the reconciliation process, or the option would no longer be viable. Allegations that Congressman Ruben Kihuen sexually harassed a campaign staffer led some in congressional leadership to call for his resignation. Kihuen later announced he would not seek another term in office. Senator Al Franken announced he would resign "in the coming weeks" after photographs were made public suggesting that he sexually assaulted (groped) a Los Angeles-based radio personality during a USO tour in Iraq in 2006. He was also accused by multiple female constituents of groping at various Minnesota fair appearances that he attended. Allegations that President Donald Trump previously raped and sexually harassed at least nineteen women, one girl, and Miss Teen USA contestants resulted in calls by members of Congress for him to resign. Allegations that Republican Alabama Senate candidate Roy Moore previously raped and sexually harassed at least eight women and one girl contributed to his defeat by Democrat Doug Jones in a special Senate election to replace Attorney General Jeff Sessions. Allegations that Representative Blake Farenthold sexually harassed a former staffer resulted in the commencement of an investigation by the House Ethics Committee and his announcement he would not seek re-election in 2018. He subsequently resigned on April 6, 2018. October 6, 2018: Senate confirms Brett Kavanaugh's nomination to the U.S. Supreme Court. November 28, 2018: Senate discharges from committee and calendars S.J.Res. 54, bill that ends US intervention in the Yemeni Civil War. Note: Demographics are accurate as of the commencement of the 115th Congress on January 3, 2017. The average age of members of the House of Representatives during the 115th Congress was 57.8 years, while the average age of U.S. senators was 61.8 years. The most common occupation of senators prior to being elected to their posts was law, followed by public service/politics and business. In the House of Representatives, business was the dominant prior occupation, followed by public service/politics and law. In the 115th Congress, 94.1% of House members and 100% of Senators had attained a bachelor's degree or a higher degree; this was a historically high level of education for a United States Congress. In addition, 167 members of the House and 55 members of the Senate had law degrees. Only 18 members of Congress had no college education. Ethnic minorities in the 115th Congress consisted of 52 African American members, 45 Hispanic or Latino members, 18 Asian-American or Pacific Islander members, and two members of Native American ancestry. Women comprised 20.1% of the membership in the 115th Congress, which had 109 women and 326 men. This represented an increase of 21 women from the 114th Congress. 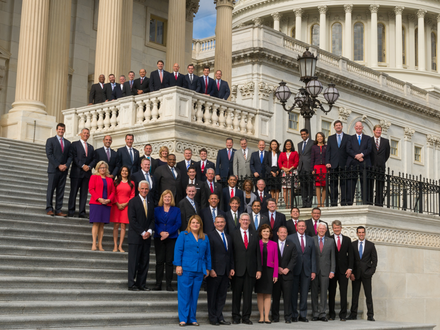 Seven openly LGBT members served in the 115th Congress. Tammy Baldwin, Jared Polis, Sean Patrick Maloney, Mark Takano, David Cicilline, and Mark Pocan are openly gay, while Kyrsten Sinema is openly bisexual. The majority of the 115th Congress was religiously affiliated, with 90.7% identifying as Christians. Approximately half of the Christians were Protestant. Other religious faiths of congressmembers in the 115th Congress included Buddhism, Hinduism, Islam, and Judaism. The numbers refer to their Senate classes. All of the class 3 seats were contested in the November 2016 elections. 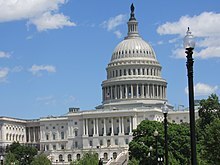 Class 1 terms end with this Congress, requiring re-election in 2018; Class 2 began in the last Congress, requiring re-election in 2020; and Class 3 began in this Congress, requiring re-election in 2022. 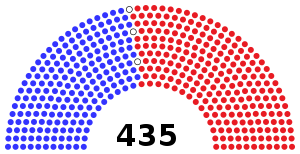 For year of birth, when first took office, prior background, and education, see Current members of the United States House of Representatives. All 435 seats were filled by the regular elections on November 8, 2016, or subsequent special elections thereafter. Results of the 2016 elections that were first seated in this Congress. 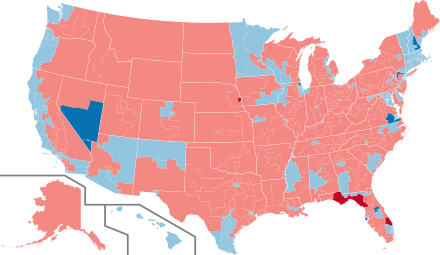 Pale blue are Democratic holds; pale red are Republican holds; bright blue are Democratic gains; bright red are Republican gains. (R) Resigned February 8, 2017, to become U.S. Attorney General. (D) Resigned January 2, 2018, amid a sexual misconduct scandal. Successor appointed January 2, 2018, to continue the term. (R) Appointment expired January 3, 2018, following a special election. (R) Resigned April 1, 2018, for health reasons. (R) Died August 25, 2018. (R) Resigned December 31, 2018. (R) Resigned January 23, 2017, to become Director of the Central Intelligence Agency. (D) Resigned January 24, 2017, to become Attorney General of California. (R) Resigned February 10, 2017, to become U.S. Secretary of Health and Human Services. (R) Resigned February 16, 2017, to become Director of the Office of Management and Budget. (R) Resigned March 1, 2017, to become U.S. Secretary of the Interior. (R) Resigned June 30, 2017, for health reasons. (R) Resigned October 21, 2017. (D) Resigned December 5, 2017. (R) Resigned December 8, 2017. (R) Resigned January 15, 2018, to lead the Ohio Business Roundtable. (D) Died March 16, 2018. (R) Resigned April 6, 2018. (R) Resigned April 23, 2018, to become the Administrator of National Aeronautics and Space Administration. (R) Resigned April 27, 2018. (R) Resigned May 12, 2018. (R) Resigned September 10, 2018. (R) Resigned September 30, 2018, to become justice of the Supreme Court of Appeals of West Virginia. Seat remained vacant until determined by general election. (D) Resigned December 31, 2018, to become Governor of New Mexico. Listed alphabetically by chamber, including Chairman and Ranking Member. ^ a b c In Alabama, Senator Jeff Sessions (R) resigned February 8, 2017. Luther Strange (R) was appointed February 9, 2017, to continue the term. Doug Jones (D) was elected to finish the term and qualified January 3, 2018. ^ a b In Minnesota, Senator Al Franken (D) resigned January 2, 2018. Tina Smith (D) was appointed January 3, 2018, to continue the term. ^ a b In Mississippi, Senator Thad Cochran (R) resigned April 1, 2018. Cindy Hyde-Smith (R) was appointed April 2, 2018, to continue the term. ^ a b c In Arizona, Senator John McCain (R) died August 25, 2018. Jon Kyl (R) was appointed September 4, 2018, to continue the term. Kyl announced his resignation, effective December 31, 2018. ^ a b In Kansas's 4th district: Mike Pompeo (R) resigned January 23, 2017, and Ron Estes (R) was elected April 11, 2017. ^ a b In California's 34th district: Xavier Becerra (D) resigned January 24, 2017, and Jimmy Gomez (D) was elected June 6, 2017. ^ a b In Georgia's 6th district: Tom Price (R) resigned February 10, 2017, and Karen Handel (R) was elected June 20, 2017. ^ a b In South Carolina's 5th district: Mick Mulvaney (R) resigned February 16, 2017, and Ralph Norman (R) was elected June 20, 2017. ^ a b In Montana's at-large district: Ryan Zinke (R) resigned March 1, 2017, and Greg Gianforte (R) was elected May 25, 2017. ^ a b c d e f g h i j k Service begins on the day of a special election, when qualified, not necessarily upon the oath of office. ^ a b In Utah's 3rd district: Jason Chaffetz (R) resigned June 30, 2017, and John Curtis (R) was elected November 7, 2017. ^ a b In Pennsylvania's 18th district: Tim Murphy (R) resigned October 21, 2017, and Conor Lamb (D) was elected March 13, 2018. ^ a b In Michigan's 13th district: Rep. John Conyers (D) resigned December 5, 2017, and Brenda Jones (D) was elected November 6, 2018. ^ a b In Arizona's 8th district: Trent Franks (R) resigned December 8, 2017, and Debbie Lesko (R) was elected April 24, 2018. ^ a b In Ohio's 12th district: Pat Tiberi (R) resigned January 15, 2018, and Troy Balderson (R) was elected August 7, 2018, although the results weren't final until August 24, 2018. ^ a b In New York's 25th district: Louise Slaughter (D) died March 16, 2018, and Joseph D. Morelle (D) was elected November 6, 2018. ^ a b In Texas's 27th district: Blake Farenthold (R) resigned April 6, 2018, and Michael Cloud (R) was elected June 30, 2018. ^ a b In Oklahoma's 1st district: Jim Bridenstine (R) resigned April 23, 2018, and Kevin Hern (R) was elected November 6, 2018. ^ a b In Pennsylvania's 7th district: Pat Meehan (R) resigned April 27, 2018, and Mary Gay Scanlon (D) was elected November 6, 2018. ^ a b In Pennsylvania's 15th district: Charlie Dent (R) resigned May 12, 2018 and Susan Wild (D) was elected November 6, 2018. ^ In Florida's 6th district: Ron DeSantis (R) resigned September 10, 2018. ^ In West Virginia's 3rd district: Evan Jenkins (R) resigned September 30, 2018. ^ In New Mexico's 1st district: Michelle Lujan Grisham (D) resigned December 31, 2018. ^ a b c d e f g h i The Minnesota Democratic–Farmer–Labor Party (DFL) and the North Dakota Democratic-Nonpartisan League Party (D-NPL) are the Minnesota and North Dakota affiliates of the U.S. Democratic Party and are counted as Democrats. ^ In Ohio's 12th congressional district, the special election on August 7, 2018, was so close that it wasn't settled until August 24, 2018. ^ a b H.Res. 670, §3(b), and "House Floor Activities | Legislative Days of January 3, 2018". Office of the Clerk of the United States House of Representatives. Retrieved January 4, 2018. ^ Lee, Frances E. (July 31, 2018). "The 115th Congress and Questions of Party Unity in a Polarized Era". The Journal of Politics. 80 (4): 1464–1473. doi:10.1086/699335. ISSN 0022-3816. ^ a b Binder, Sarah (2018). "Dodging the Rules in Trump's Republican Congress". The Journal of Politics. 80 (4): 1454–1463. doi:10.1086/699334. ISSN 0022-3816. ^ Pearson, Kathryn (January 1, 2017). "President Trump and Congressional Republicans: Uncertain Teamwork in the 115th Congress". The Forum. 15 (3). doi:10.1515/for-2017-0033. ISSN 1540-8884. ^ Edwards III, George C. (January 1, 2017). "No Deal: Donald Trump's Leadership of Congress". The Forum. 15 (3). doi:10.1515/for-2017-0031. ISSN 1540-8884. ^ "House Overwhelmingly Votes to Condemn UN Resolution on Israel Settlements". Fox News. January 5, 2017. Retrieved January 7, 2017. ^ Kurtzleben, Danielle (January 12, 2017). "Senate Takes First Step To Repeal Obamacare — So What's Next?". NPR. Retrieved January 12, 2017. ^ Strafford, Michael; Emma, Caitlin; Heffling, Kimberly (February 7, 2017). "Senate confirms DeVos as secretary of education". Politico. Retrieved February 8, 2017. ^ Caygle, Heather (December 7, 2017). "Democrat Kihuen hanging on despite harassment claim". Politico. Retrieved December 8, 2017. ^ Watson, Kathryn (December 16, 2017). "Facing ethics probe, Rep. Ruben Kihuen won't run for re-election". CBS News. Retrieved December 17, 2017. ^ Gay Stolberg, Sheryl; Alcindor, Yamiche; Fandos, Nicholas (December 7, 2017). "Al Franken to Resign From Senate Amid Harassment Allegations". New York Times. Retrieved December 8, 2017. ^ Viebeck, Elise; Weigel, David (December 5, 2017). "Rep. John Conyers Jr. resigns over sexual harassment allegations after a half-century in Congress". Washington Post. Retrieved December 8, 2017. ^ Bade, Rachel (December 8, 2017). "Franks to resign Friday after harassment allegations". Politico. Retrieved December 8, 2017. ^ CNN, Mick Krever and Sophie Tatum, (December 11, 2017). "Exclusive: Gillibrand calls on Trump to resign". CNN.com. Retrieved January 16, 2018. ^ Edelman, Adam; Caldwell, Leigh Ann (December 8, 2017). "Ethics probe into Farenthold picks up steam after accuser agrees to cooperate". NBC News. Retrieved December 8, 2017. ^ a b Brufke, Juliegrace (April 6, 2018). "GOP Rep. Farenthold resigns amid sexual harassment scandal". The Hill. Retrieved April 6, 2018. ^ Kaplan, Thomas. "House Passes Measure to Repeal and Replace the Affordable Care Act". NY Times. Retrieved May 4, 2017. ^ "Office of the Clerk of the U.S. House of Representatives". June 8, 2017. Retrieved June 10, 2017. ^ a b Taylor, Jessica (December 14, 2018). "Arizona Sen. Jon Kyl To Step Down, Leaving McCain's Seat Vacant Again". NPR. Retrieved December 14, 2018. ^ a b c "Senate Democrats elect Chuck Schumer as their new leader". Retrieved March 19, 2017. ^ a b c Everett, Burgess; Schor, Elana (November 16, 2016). "Senate Democrats settle on leadership team, Sanders elevated". Politico. Retrieved January 3, 2017. ^ Robillard, Kevin; Schor, Elana (November 18, 2016). "Van Hollen to serve as DSCC chair". politico.com. Retrieved March 12, 2017. ^ a b c d e f "Membership of the 115th Congress: A Profile" (PDF). Congressional Research Service. November 13, 2017. Retrieved November 22, 2017. ^ "Wisconsin's Tammy Baldwin is the first openly gay person elected to Senate". CNN. November 7, 2012. Retrieved October 5, 2017. ^ Parkinson, John (September 30, 2011). "House Democrat Jared Polis Becomes First Openly Gay Parent in Congress". ABC News. Retrieved September 30, 2011. ^ Candido, Sergio N. (October 29, 2012). "Top 5 Gay National Races". South Florida Gay News. Retrieved October 5, 2017. ^ a b "Certificate of Appointment of United States Senator from Minnesota" (PDF). Minnesota.gov. January 2, 2018. Retrieved January 3, 2018. ^ United States Congress. "Jefferson Beauregard Sessions III (id: S001141)". Biographical Directory of the United States Congress. Retrieved February 14, 2017. ^ News, A. B. C. (February 9, 2017). "Alabama's Attorney General to Replace Jeff Sessions in Senate". ABC News. ^ "Franken to resign Jan 2 over sexual misconduct allegations". The Washington Post. December 20, 2017. Retrieved December 20, 2017. ^ "Governor Moves Special Election for Alabama Senate Seat". Roll Call. Retrieved April 18, 2017. ^ Koplowitz, Howard (December 31, 2017). "Doug Jones to be sworn into Senate seat Wednesday on family Bible". The Birmingham News. Retrieved January 1, 2018. ^ "Cochran resigns effective April 1". ^ CNN, Stephen Collinson,. "John McCain, senator and former presidential candidate, dies at 81". ^ "Former U.S. Sen. Jon Kyl will be John McCain's successor in the U.S. Senate". ^ "Rep. Mike Pompeo (R-KS04) resignation letter read in House after Senate CIA Director confirmation". Retrieved March 19, 2017. ^ "Sam Brownback on Twitter". Retrieved March 19, 2017. ^ McDonnell, Patrick J. (January 24, 2017). "Xavier Becerra takes oath of office, is first Latino to become California attorney general". Los Angeles Times. Retrieved January 24, 2017. ^ "Assemblyman Jimmy Gomez Wins Special Election To Represent California's 34th District In Congress". Archived from the original on November 23, 2017. Retrieved December 8, 2017. ^ "Farewell by Rep. Tom Price". ^ "Karen Handel Wins Georgia Special Election, Fending Off Upstart Democrat". ^ a b "Current Vacanies, 115th Congress". ^ "Mulvaney's confirmation makes replacement election official". February 16, 2017. Archived from the original on February 17, 2017. ^ Lutey, Tom. "Zinke sworn in as Interior secretary; Montana prepares for special election". Retrieved March 19, 2017. ^ Chaffetz, Jason (May 18, 2017). "Chaffetz Letter to Utah's 3rd Congressional District". U.S. Congressman Jason Chaffetz. Archived from the original on May 18, 2017. Retrieved May 18, 2017. ^ Bloch, Matthew; Lee, Jasmine (November 8, 2017). "Election Results: Curtis Wins U.S. House Seat in Utah". The New York Times. ^ Bade, Rachael. "Tim Murphy resigns from Congress". Retrieved October 5, 2017. ^ "Special election date set for Tim Murphy's congressional seat". ^ "John Conyers resigns from Congress after sexual harassment allegations". ^ "Conyers' Seat Will Remain Vacant for 11 Months". ^ "Rashida Tlaib wins U.S. House seat, becomes among first Muslim-American women elected". ^ Rousselle, Christine (December 8, 2017). "BREAKING: Trent Franks Resigns, Effective Immediately". TownHall.com. Retrieved January 16, 2018. ^ Hansen, Ronald J. (December 11, 2017). "Dates set for special election to replace Rep. Trent Franks". AzCentral.com. Retrieved January 16, 2018. ^ Tiberi, Pat (October 19, 2017). "Statement by Congressman Pat Tiberi". U.S. Congressman Pat Tiberi. Archived from the original on October 23, 2017. Retrieved October 22, 2017. ^ Wehrman, Jessica (January 3, 2018). "Tiberi's last day in Congress will be Jan. 15". The Columbus Dispatch. Retrieved January 4, 2018. ^ "Louise Slaughter, longtime progressive New York congresswoman, dies at 88". ^ "Cuomo sets date for special election to fill 25th Congressional seat". ^ Svitek, Patrick. "Texas Gov. Greg Abbott schedules June 30 special election to fill U.S. Rep. Blake Farenthold's seat". Texas Tribute. Retrieved April 24, 2018. ^ Lesniewski, Niels; Bowman, Bridget; Lesniewski, Niels; Bowman, Bridget (April 19, 2018). "Tammy Duckworth and Baby Cast Their First Senate Vote Together, Opposing NASA Nominee" – via www.rollcall.com. ^ Olson, Laura. "With Susan Wild taking her oath, the Lehigh Valley once again has a lawmaker in the U.S. House". themorningcall.com. Retrieved December 21, 2018. ^ Dixon, Matt. "DeSantis steps down from Congress to focus on governor's race". Politico. Retrieved September 10, 2018. ^ Roll Call Staff. "Evan Jenkins to Resign Seat on Sunday, Head to West Virginia Supreme Court". Roll Call. Retrieved September 29, 2018. ^ "Committee Chair Recommendations for the 115th Congress". Speaker.gov. December 1, 2016. Archived from the original on December 3, 2016. Retrieved December 5, 2016. ^ a b c d e f "Senate Organization Chart for the 114th Congress". Senate.gov. United States Senate. Retrieved January 4, 2018. ^ "The Office of the Chaplain, United States House of Representatives". Chaplain.House.gov. Retrieved January 16, 2018. ^ "CAO Senior Management". Retrieved January 4, 2018. ^ "About The Clerk's Office". Retrieved January 4, 2018. ^ "Parliamentarian of the House". United States House of Representatives. Retrieved January 4, 2018. ^ "Sergeant at Arms". United States House of Representatives. Retrieved January 4, 2018. "Videos of House of Representatives Sessions for the 115th Congress from www.C-SPAN.org". "Videos of Senate Sessions for the 115th Congress from www.C-SPAN.org". "Videos of Committees from the House and Senate for the 115th Congress from www.C-SPAN.org". House of Representatives Session Calendar for the 115th Congress, 2017 calendar (PDF). Senate Session Calendar for the 115th Congress (PDF). Congressional Pictorial Directory for the 115th Congress (PDF). Official Congressional Directory for the 115th Congress (PDF).